The Constitution is the base for all laws in the United States. The Constitution is the highest law in the United States. All other laws come from the Constitution. It says how the government works. It creates the Presidency. It creates the Congress. It creates the Supreme Court. Each state also has a constitution. The constitutions of the states are their highest law for that state — but the United States Constitution is higher. The Constitution can be changed. The Constitution is changed by an "amendment." Among the amendments is a list of the rights of the people. By listing these rights, they are made special. It is illegal for the government to violate those rights. As of 2006, there are 27 amendments. Not all of them involve rights, but many do. The first ten amendments are special. They are called the Bill of Rights. The Framers worked for four months over the course of a hot summer in Philadelphia to craft the Constitution. The Constitution was written in 1787. Yes, it is over 200 years old. We actually have old copies of what was created. The master copies are stored at the National Archives in Washington D.C. We also have pictures of the Constitution on this site. From May to September 1787 a group of men known as the Framers met. The Framers talked about what should be in the Constitution. The United States was a brand new country. The United States had a government that did not work very well. The Framers met to find a new way of running the country. This meeting is called The Convention. Some of the Framers are famous to us today. They include James Madison, Ben Franklin, and George Washington. At that time there were only 13 states. The men came from all the states except Rhode Island. Each state had ideas for the new government. The Framers had many debates. They talked a lot. They make a lot of speeches. By talking about it, they came up with a plan that everyone could agree with. They had to have a lot of compromises. Only by agreeing could all the arguments be worked out. Ben Franklin said the he was not sure if the plan was perfect. He said that it was probably as perfect as it could be. This map of the United States was published in 1784 by William Faden. After the Convention, the Constitution had to be approved. Actually, only nine states had to agree to, or ratify, the Constitution. But everyone wanted all 13 states to agree. Two states took a long time to decide to agree. These states were Rhode Island and North Carolina. In the end, they did agree. 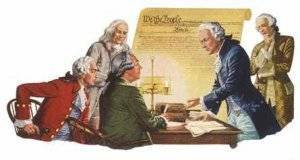 Once the first nine states agreed, we say the Constitution was "ratified." New Hampshire was the ninth state to ratify. When the Constitution was written, the Framers knew their creation was not perfect. They knew that other people would have good ideas for the Constitution. They wanted to be sure that it wasn't too hard to make changes. They also wanted to be sure that it wasn't too easy. The Framers added an amendment process. An amendment to the Constitution is a change that can add to the Constitution or change an older part of it. Originally, some people did not want to ratify the Constitution. One big reason was that it did not have a bill of rights. A bill of rights is a list of rights that belong to the people. The government is not allowed to break these rights. Some of these rights might sound familiar: the right of free speech; the right to practice your own religion; the right to be silent if you are arrested. The original Constitution had no bill of rights. Many of the Framers did not think it was needed. But many people wanted one. So, promises were made to add one, using the amendment process. Soon, the new government started meeting. Congress proposed the Bill of Rights. A list of twelve changes was sent to the states. In 1791, ten of those changes were agreed to by the states. The ten changes were added to the Constitution. These ten changes are called the "Bill of Rights." Other changes to the Constitution are discussed below. The last change to the Constitution was made in 1992. The 27th Amendment is actually one of the two left-over amendments from 1791. It is very unusual for an amendment to take that long to be accepted, but it is possible. Some, like the 26th Amendment, are accepted very quickly, in just 100 days. Most, though, take a little over a year to be ratified. 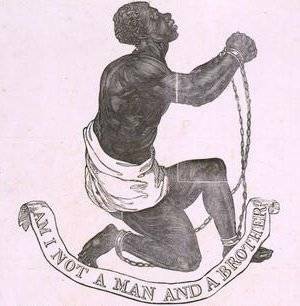 This image of a black slave appealed to the humanity of free whites, asking, "Am I not a man and a brother?" The image accompanied the antislavery poem "Our Countrymen in Chains" by John Greenleaf Whittier, published in 1837. In 1787, most of the black people in America were slaves. A slave is someone who is owned by someone else. Today, there are no legal slaves in America. It was common in 1787. As time went by, more people thought that slavery was wrong. Most of the people who wanted to end slavery were from the states in the north. They were called abolitionists. Most of the people who wanted to keep slavery were from the states in the south. Slavery was important in the South. A lot of how the people in the south made money involved slaves. Slaves were worth money. Slaves picked their crops, like cotton and tobacco. The people in the North wanted to end slavery. They said it was an important step for America. The people of the South were afraid of losing slavery. They were afraid of losing business. They thought that having slavery was important for each state choose on its own. When President Lincoln was elected, the South got very angry. Lincoln had said he didn't like slavery. Most of the Southern states decided to break away from the United States. They created their own country. It was called the Confederate States of America. The USA did not agree that the states of the CSA could break away. The Civil War followed. The USA won that war. It was a terrible war. Many people died. Many buildings were destroyed. Something good did happen, though. Slavery ended. With the 13th Amendment, slavery was made illegal. The 14th Amendment said that every person born in the United States was a full citizen. Even former slaves were full citizens. The 15th Amendment made sure that black people could vote. These changes protected many freedoms. But it took a long time to change peoples' minds. Many people still did not like black people. They thought that white people were better. For 100 years, some laws reflected this feeling. Today, these laws are also gone. Most people do not think that anyone is better than someone else just because of their color. 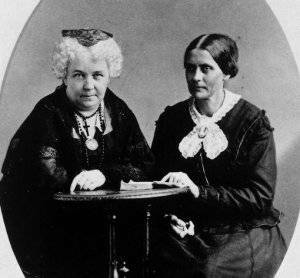 A portrait of Elizabeth Cady Stanton and Susan B. Anthony. Stanton and Anthony were leaders in the "suffragette" movement, the movement to give the vote to women. At the beginning, we talked about the men who were the Framers. For a long time, most of the people who shaped the country were men. This is not because women could not help. It is not because women did not want to help. Instead, men held all the positions of power. Men were the Presidents. Men were the members of Congress. Men were the mayors. Men were the owners of companies. Women had very little chance to advance in life. Today, many women like taking care of the home. Today, though, this is a choice. Before, this was the only option for a woman. Women had no role in government. They had no role in politics. They were homemakers. They took care of their husbands or fathers. They took care of kids. Most men did not feel that women should vote. There were actually laws that said women could not vote. Many people decided this was wrong and many women and some men fought against it. Finally, in 1920, the 19th Amendment was passed. It says that women can vote in all elections. Today, women are active in government and politics. Being able to vote is a big part of that. Without the ability to vote, women had no voice. Without a voice, there was no reason for politicians to care what women think. They did not care about issues that are important to women. Once women could vote, some got very interested in politics. Some women ran for office. There have not yet been any women as President. However, it is only a matter of time before the first woman President is elected. 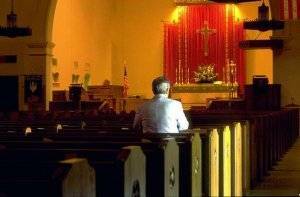 The Bill of Rights protects the freedom of, and from, religion. We already talked about the Bill of Rights. It was passed because some people were afraid that the government would have too much power. They were afraid that some important things could be made illegal. They wanted to be sure to keep those things legal. For example, you can say whatever you want about the President. You can say that you don't like his hair. You can say you don't like his voice. You can say you don't like the war in Iraq. You can say you don't like his tax ideas. It seems normal to us to be able to say these things. We can criticize the President. We can criticize a member of Congress. We can criticize a mayor. We can say what things they do that we don't like. This is only possible because of the Right of Free Speech. The Bill of Rights protects Free Speech. The freedom to express yourself, in speech, in writing, and in protest, is also protected by the Bill of Rights. Imagine if there was no right to free speech. A law could be passed that says that if you criticize the President's hair, you can spend a day in jail. Or worse, criticizing the President's taxes can get you a year in jail. These are the kinds of laws that the Framers were afraid of. The Bill of Rights protects us from such laws. We cannot be put in jail because of our opinions. The Bill of Rights protects a lot of other freedoms. For example, you can believe in any religion you want. The government cannot force you to believe in something. You cannot be forced to house soldiers in your home. The police cannot come into your home without a good reason. The police may not take your papers without reason. The police cannot force you testify against yourself in court. In fact, the police cannot force you to tell them anything at all. This is called the "right to remain silent". And you cannot be given unusual punishments. You cannot be given twenty years in jail for speeding. An interior view of the House of Representatives, the "lower" house of the United States Congress. 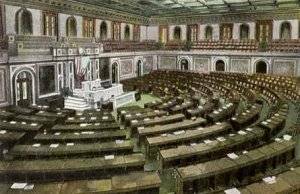 The House is known as the "peoples' house" because since the beginning, the members were elected by the people. The Constitution sets up the government. It is split into three branches. The first is the Legislative. The second is the Executive. The third is the Judiciary. Each one has its own role in how the law is made and used. The Legislature makes the law. The legislature is called the Congress. It is split into two parts. The first is the House of Representatives. The second is the Senate. Each Representative comes from a district in one of the states. That person's job is to represent the people in that district. The people elect the Representative. They have the right to tell him or her how they feel about issues. There are 435 Representatives. Bigger states have more Representatives. Every state has at least one. The Senate is made up of 100 Senators. There are two Senators from each state. The people elect Senators. Senators should represent the interests of all of the people. When the Congress wants to pass a law, both the House and the Senate must agree to the exact same law. If they cannot agree, then the law cannot pass. A Presidential bill-signing ceremony. 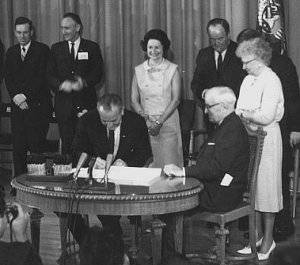 In this image, Lyndon Johnson is signing the Medicare Bill in 1965, as former President Harry Truman looks on. The role of the Executive is mainly to make sure the law is carried out. The President heads the Executive. The Executive also includes the Vice President. The Secretaries of all the departments are also in the Executive. One department is the Department of Homeland Security. Another is the Department of Education. And one more is the Department of Defense. Before a law becomes a law, the President must agree to it. If he does not agree, he rejects, or vetoes, the law. When he vetoes a law, he sends it back to the Congress. Congress can then try to pass the law again. The President can also refuse to sign a law — if he does, it will become a law any way. The government has lots of checks and balances. This is one example of the checks and balances. The Congress must pass laws the President will agree to. The President is accountable for his decisions regarding laws. The last branch is the Judiciary. This includes all the federal courts, all the way up to the Supreme Court. States have their own court systems, too. The state courts are under the national courts. The role of the Judiciary is to interpret the law. The law might say, "It is illegal to break into someone's home." If someone is caught breaking into a home, the courts will ask several questions. First, can the government make this illegal? If it cannot, the law is called "unconstitutional." Such laws are invalid. Next, the court will ask if the person is actually guilty. Usually, a jury will find someone guilty or not guilty. Sometimes just a judge decides this. A trial by jury is a right. It means that other people from your area will decide if you broke the law. Sometimes juries, and courts, make mistakes. If someone is found guilty, they can "appeal." There is a set of special courts set up for appeals. The last court of appeal is the Supreme Court. Whatever the Supreme Court says is the end. There is no appeals court higher than the Supreme Court. This page is a very basic introduction to the Constitution. It also talks about some of the topics that surround it. There are lots of good books in your local library, too. They will let you get a lot more detail. This site also has a lot of good pages that have more detail. See the list of links below for some of these pages.